Political Ecology Working Group (PEWG). This conference concerns the recent innovations and insights for the study of ontologies and socialities engendered through the “species turn” — that is, the intellectual turn to, and reflection upon, life beyond the human species in the arts, humanities, and social sciences. Emerging over the last few decades of the 20th century, the species turn developed (1) from a diverse array of analytical and theoretical formations concerned with aspects of the nonhuman (animate and inanimate), including actor-network theory, affect theory, animal studies, assemblage theory, the new materialism, and systems theory; and (2) in productive tension with a parallel intellectual development — posthumanism — articulated through such innovative theoretical work as Katherine Hayles’ How We Became Posthuman and Cary Wolfe’s What Is Posthumanism? While all approaches hold their own particular aims, objects, and methodologies, they urge us to consider that we, humans, are not alone. That is, we live in a world populated by and constituted through life forms and forms of life beyond the human. And as such, we must critically reconsider who “we” are in terms that challenge the limitations and dangers of anthropocentrism. If you have any questions, please send them to multispeciesworld@gmail.com. 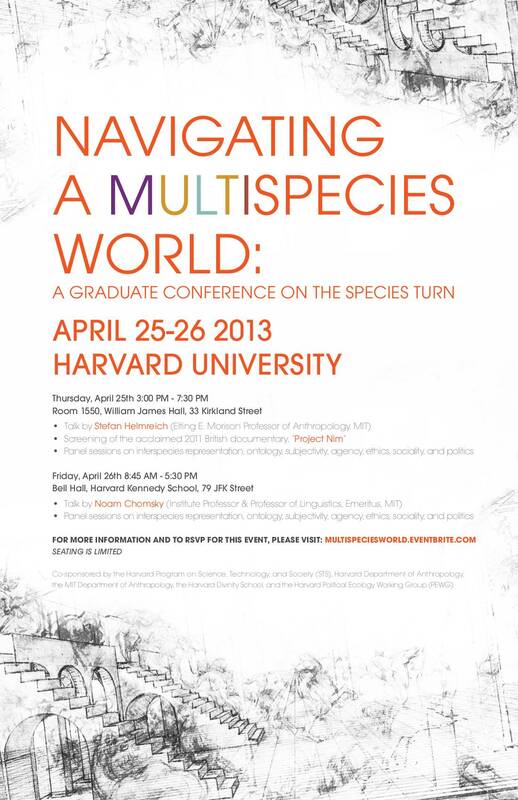 Leave a reply on "Navigating A Multispecies World : Conference at Harvard University"